Another option in travelling from Venice would be to take one of the numerous daily trains from Venice Santa Lucia or Mestre stations to Trieste and then change there for more transportation options to Croatia. See the Trenitalia website for train timetables. There are many cheap flights from the UK to Venice Marco Polo Airport, operated by various airlines. 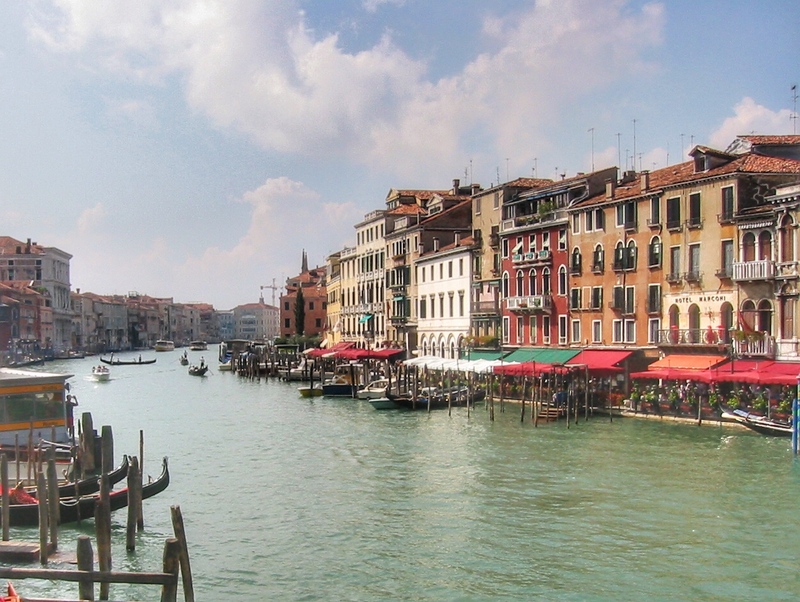 (There are also cheap flights to Venice Treviso, which is a completely different airport – see how to get from Treviso to Croatia.) So if you can’t find suitable flights direct to Croatia, flying to Venice instead and travelling across is very do-able. There are several daily services from Venice to Pula – FILS and Brioni both run services, with the second company having a route that starts in Padua and stops in Buje and Rovinj along the way. Crnja Tours also operate daily services from Venice to Pula as well – again, this route starts actually in Padua. The bus stops in Trieste, Koper (Slovenia), Umag, Novigrad, Porec and Rovinj before reaching Pula. Can I travel from Venice to Split or Dubrovnik by ferry? It’s a question we get asked quite frequently but, unfortunately, no – there are no ferries from Venice to either Split or Dubrovnik. Aside from the catamaran services to Istria and Mali Losinj (mentioned above), there is no ferry service from Venice to anywhere else in Croatia. But what if I do want to get from Venice to Split or Dubrovnik? By far the easiest way of travelling from Venice to Dubrovnik is by air – Croatia Airlines operate this as a twice-weekly service in summer. If you’re utilising this route and wanted to get to Split, you could then also take a bus (about 4.5 hours) up to Split. Volotea also have twice-weekly flights during summer (mid-June to mid-September) from Venice to both Split and Dubrovnik. If you book early enough, it’s possible to get a great bargain. Easyjet fly from Venice to Split three times a week in July and August (one a week in September and October) and to Dubrovnik four times a week in July and August (twice weekly in September and October). Otherwise, travelling by train isn’t really a suitable option – train services to Split will travel via Zagreb, so this will add on unnecessary hours to your journey. Travelling by train to Dubrovnik isn’t possible at all, of course, as the town has no train station. You could travel from Venice to Trieste by train, and then take one of the daily buses from here to Split or Dubrovnik. See our guide on how to travel from Trieste to Croatia. However, the bus journey from Trieste to Split/Dubrovnik is rather long, and it’s not everyone’s cup of tea being cooped in a bus for that long! In our opinion, therefore, the best way of travelling from Venice would be to take a train down the Italian side of the Adriatic, and then take a ferry across to Croatia. You should travel to Ancona for ferry services to Split (or Zadar) or to Bari for services to Dubrovnik. Check for train schedules on the Trenitalia website, and then see our pages on travelling from Ancona and Bari.